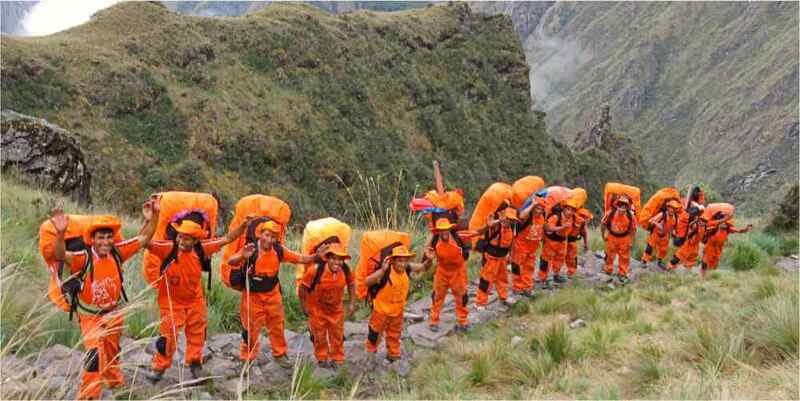 Day 2: Our Porters-The Orange Crushers!!! The Classic Inca Trail Trek is known as one of the world’s ten best hikes, the Classic Inca Trail is unparalleled for its ecological diversity and wealth of archaeological treasures. The Machu Picchu Historical Sanctuary covers 32,952 acres and it is home to a network of Inca highways, scores of archaeological sites, 10 ecological zones (from glacial peaks to tropical forests), over 450 species of birds and 200 species of orchids, as well as the legendary city of Machu Picchu. See our classic Inca Trail Machu Picchu Availability for 2019. Upon arrival at kilometer 82 (8:30am), we will have some time to organize ourselves by using the restrooms, applying sunscreen, insect repellent, etc. Once at the Inca Trail checkpoint, be ready to show your entrance tickets, passports and (if paying a student rate) your student card. At the start of the trail (2,720m/8,923ft) we will cross the Vilcanota River and follow its route towards the right. 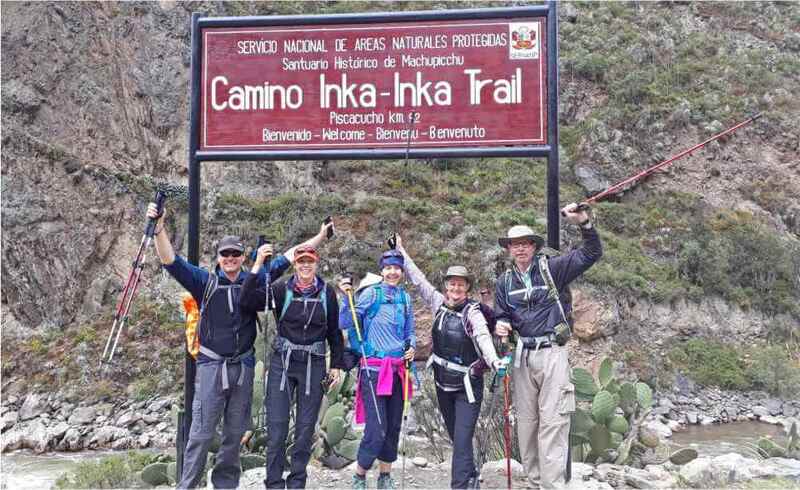 The first day is relatively easy, a warm-up along the Inca flat terrain. 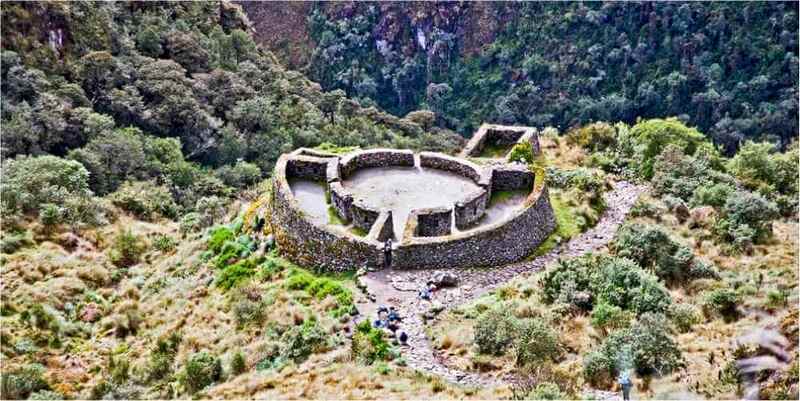 There are great views of the Inca Fortress (Huillca Raccay), the vast and incredible Inca site of Llactapata, (officially called Patallacta), the Urubamba mountain range that divides the jungle, the Andes Mountains, and the beautiful snow-capped peak of W’akay Willca (5,860m/19,225ft) known in books as Veronica. Our first campsite is in Ayapata, an hour and a half up towards the small village of Wayllabamba (3,000m/9,842ft) located in the temperate green valley of the same name. Temperatures at night are around 5ºC depending on the month. After waking up at 5 to 5:30am and enjoying a hot breakfast, we start a steep ascent towards the highest pass, Abra de Warrmihuañusca or Dead Woman’s Pass at (4,200m/13,779ft). On this day, you will feel a real sense of achievement upon reaching the top! After a well-deserved rest, we begin the descent towards our lunch spot, which is located at Pacaymayu (3,550m/11,646ft). On our way up towards the pass, we will be able to see an array of hummingbirds and a combination of other species of birds. There will be plenty of time to appreciate the incredible variety of native plants and the Polylepis or Q’ueuña trees, which grow in the astonishing cloud forest located at (3,650m/11,972ft)! 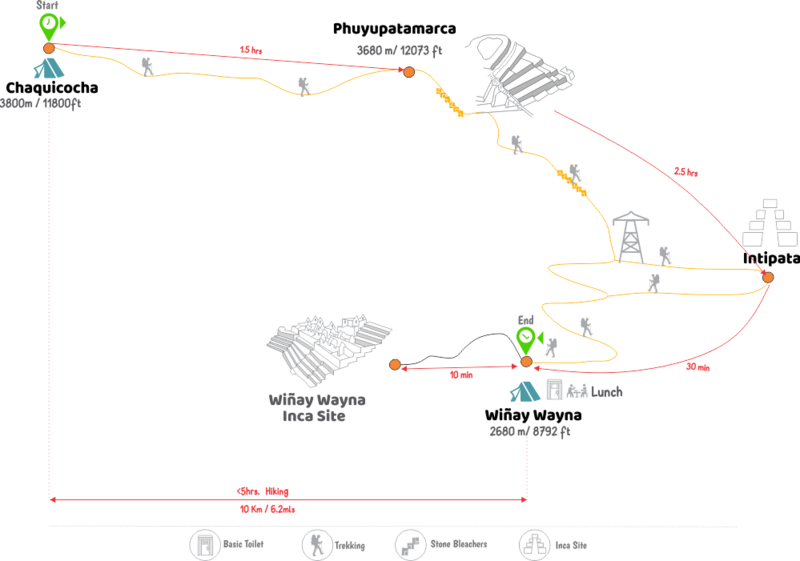 After lunch, begins the second two-hour steep climb towards Runkuraqay pass (almost 4,000m/13,123ft). We arrive at our campsite by 5 pm. Temperatures at this campsite are around 4ºC during the night. This is the most impressive day by far so keep this in mind as you ascend on day three! We wake up for breakfast at 6am and start the day with a gentle climb towards the archaeological site of ‘Phuyupatamarca’ (meaning ‘Town in the Clouds’). Here, we reach the third highest point along the Inca trail (3,680m/12,073ft). The views of the mountains, canyons and surrounding areas are spectacular! 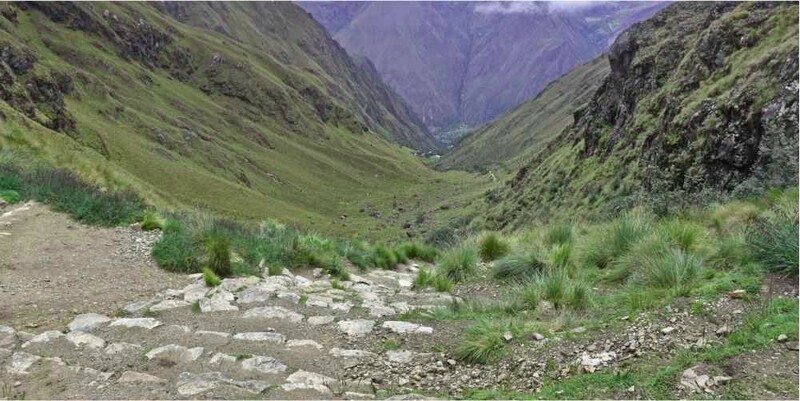 The Inca site of Phuyupatamarca, is located a few minutes’ walk from the third pass. 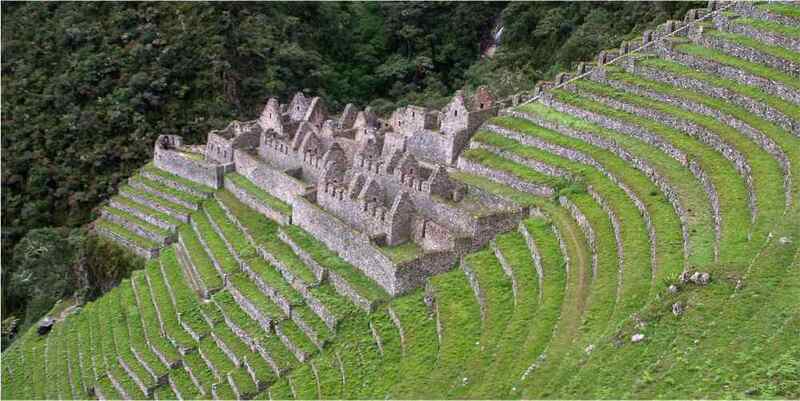 After visiting this site, we continue walking down 3,000 stairs through the cloud forest to the impressive agricultural Incan site of Intipata. 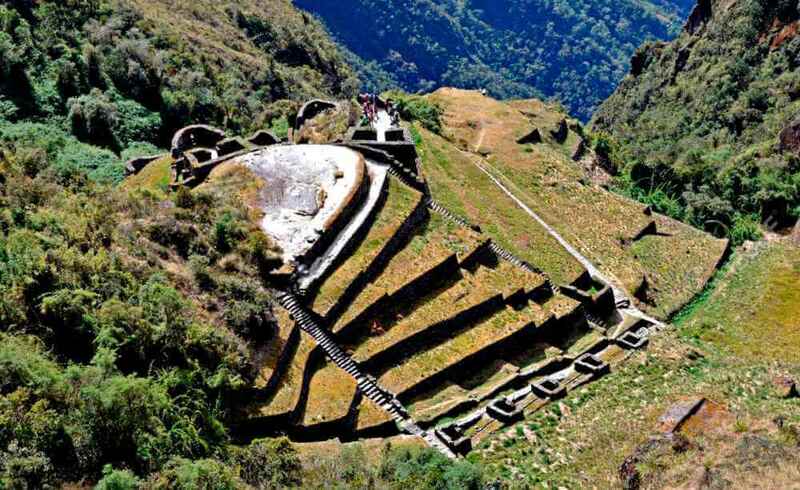 After taking some time to visit this site, we continue until we arrive at our third campsite Wiñay Wayna (2,680m/8,792ft). Today, we will only walk about 4 to 5 hours. We arrive at camp by lunchtime! 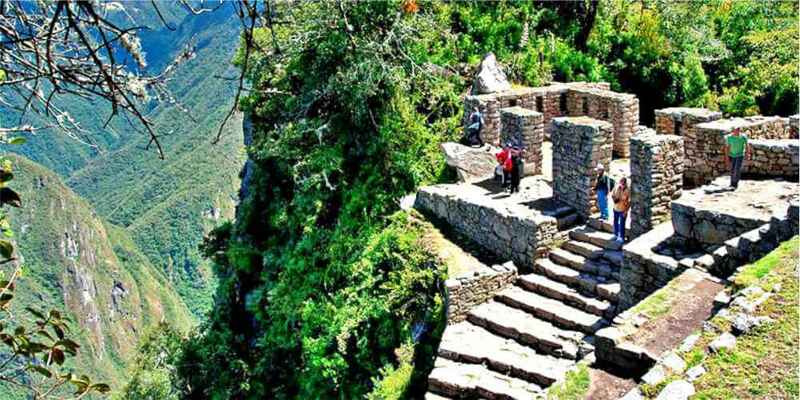 Temperatures during the night are about 12º C.
A short walk from our campsite is the famous Incan site of ‘Wiñay Wayna’ (‘Forever Young’). Even if you are feeling tired after your day’s trek, it is a moment you cannot miss! 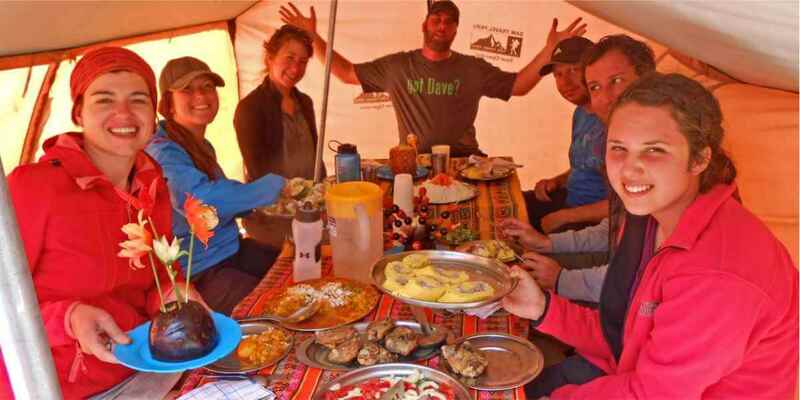 At around 4:00am, it is time to wake up, have breakfast and start day 4 on the Inca trail to get to Machu Picchu on time. This is the final part of your journey, arriving by 6:00am to reach the Sun Gate (also known as Inti Punku). At that point, the majestic Machu Picchu Citadel will be in front of us with its intense beauty – an incredible sight for all to see. At this point, we walk downhill towards Machu Picchu Citadel (2,400m/7,872 ft.). After walking 40 minutes, we enter the citadel from the top through the “House of the Guardians”. From there, we proceed towards the control point, where we register and leave our belongings. Your professional guide will direct you throughout the astounding ruins and its main streets. You can wander around the town squares as well as climb the intricately carved stone stairways. Machu Picchu is considered as the world’s spiritual center by esoteric wisdom. Once the guided tour is over, you will have free time to explore the site on your own. You will descend to Aguas Calientes by bus (included) andboard the Expedition train by 4:22pm to head towards the Ollantaytambo Train Station. This is where you will meet our private van and be transferred to your hotel in Cusco arriving around 8:30pm. 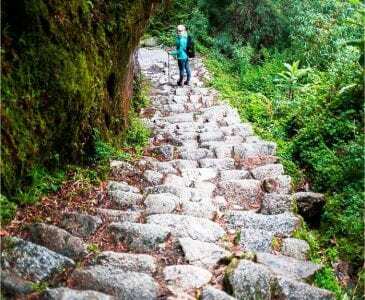 *** Huayna Picchu or Machu Picchu Mountains hike depends on availability, please let us know if you want to add one of these extra hikes at the time of your booking. 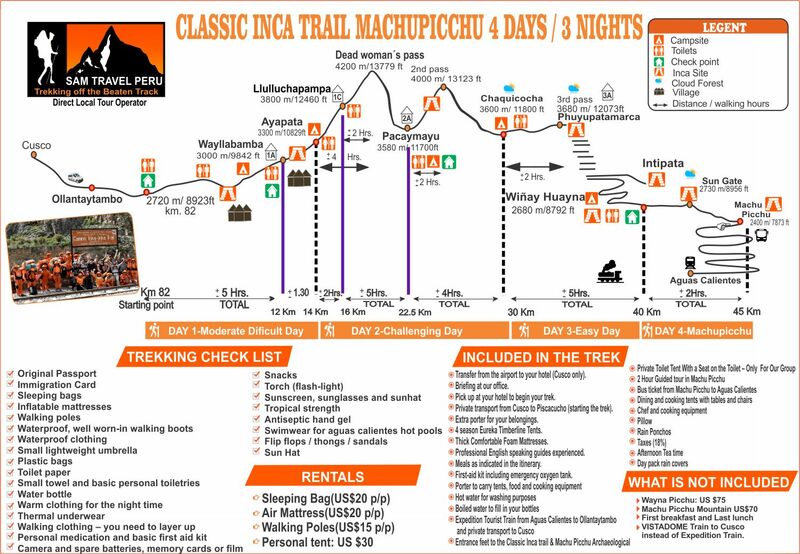 WHAT IS INCLUDED FOR THE CLASSIC INCA TRAIL TO MACHU PICCHU? Extra porter for your belongings(you will need only a day backpack to carry what you will need during day)! WHAT IS NOT INCLUDED FOR THE CLASSIC INCA TRAIL TO MACHU PICCHU? Wayna Picchu: $75 USD and Machu Picchu Mountain$70 USD – needs to be booked in advance, if you would like to add an extra hike. Please let us know at the time of booking. First breakfast and last lunch – We will stop at Ollantaytambo for the first breakfast and have the last lunch at Aguas Calientes after the tour of Machu Picchu. ***Personal Porter Included In the Price! 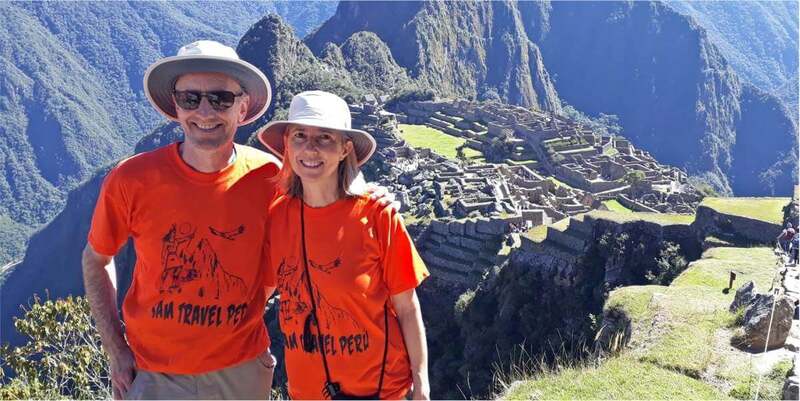 If permits are sold out for the Classic Inca Trail to Machu Picchu on your preferred date,you have so many options that will still allow you to trek and enjoy the Andes on the way to MACHU PICCHU. Alternative treks are just as beautiful as the Inca Trail. They are less crowded because we take you OFF the beaten track in the Andes and we make sure you don’t miss anything along your trek to MACHU PICCHU. 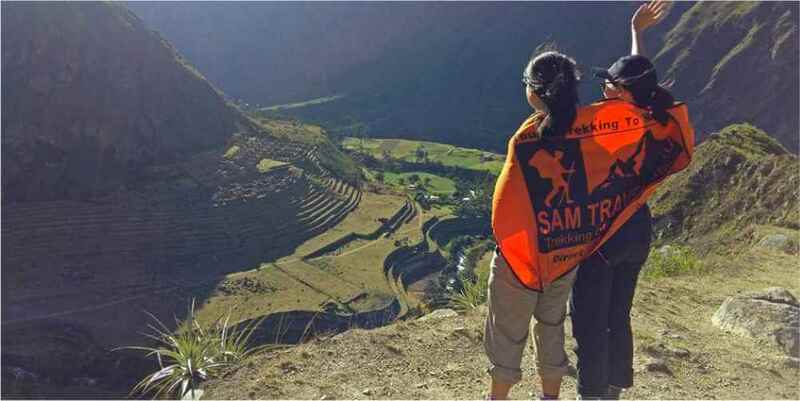 *Sam Travel Peru requires only a 2 participant minimum for our departures! You can chose any day that is best for you as long as we have a minimum of 2 trekkers. *If you are a solo traveller and are flexible with your start date, we will make sure you have a group to travel with so you won’t miss out on any of the fun. NOTE: We can buy your Classic Inca Trail to Machu Picchu trek permit(s) using copies of the passport(s)provided to us(they must to complete and accurate). If the name or number on your passport does not match the name and number on the trek permit, the Peruvian government authorities will not allow you to start the trek and you will not be entitled to a refund. You must bring the same passport with you to Cusco and take it with you on the Inca Trail, in order , to gain access at the checkpoint. If you do not advise us of the change or do not want to pay the fee, you must bring both passports (the old and new one). You can enter Peru with your new passport but you must show the government authorities your old passport, in order, to enter the Inca Trial, Machu Picchu or Train. If you cannot do so, you will not be allowed to start your trek by the government officials. OUR TENTS: Enjoy a good night sleep in our 4 season EUREKA Timberline tents. All our tents are 4 man tents, ONLY 2 persons will sleep in them, leaving lots of room to spread out comfortably and store your duffel bags. They also include a little vestibule, giving you some extra outdoor space to leave your boots and walking sticks so you don’t have to bring in dirt. You will be welcomed at the Cusco airport and taken to your hotel, please ensure that you inform us of your flight details at least 14 days prior to your trek. Look out for our representative holding an orange board SAM Travel Peru at the arrival terminal. You must exit the terminal, in order, to find our representative (they cannot enter inside). Of course! During the Classic Inca trail to Machu Picchu, your main luggage can be store at our office or at your hotel, both are free. Please pack what you will need for the trek! 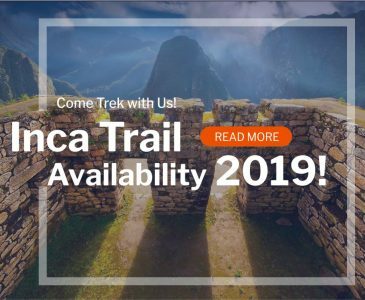 FIRST, to book your Classic Inca Trail to Machu Picchu , we need you to fill out our booking form by clicking on BOOK NOW on our homepage or click here the link BOOK NOW. *** We require copies of every participant’s passport, in order, to book Inca Trail permits! 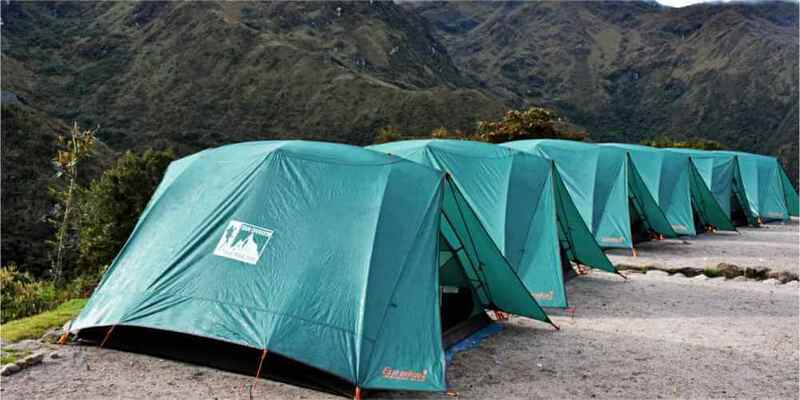 SECOND, we require a deposit of $211.00 USD per person, in order, to purchase a permit for the Classic Inca Trail. You can make you deposit by clicking on the VISA or PAYPAL symbols on the top of our home page, or you can click on the VISA or PAYPAL symbols on our booking page. 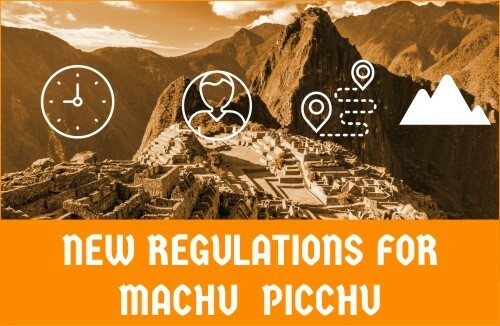 According to Peruvian Law, you must be under 18 years of age at the time of your Classic Inca Trailt to Machu Picchu trek, tour or visit to Machu Picchu (students 18 & above need student cards). For example: if you book a trek at the age of 17 but you turn 18 before you do your trek, you do not qualify for a student discount. All students from 11 to 17 years, the discount is $30 USD. For children from the age of 2 to 11 the discount is $40 USD. Unfortunately, the answer is No. Once permits have been bought the Peruvian government does not allow any changes so we can’t change any date after the permit has been bought. Permits are also not transferable nor refundable. If you cancel your Classic Inca Trail to Machu Picchu Trek, the deposit is not refundable at all! DO I NEED MY ORIGINAL PASSPORT ON THE CLASSIC INCA TRAIL TO MACHU PICCHU? Yes! You have to bring your original passport and it is very important that it is the same passport number, you sent to us to book your Classic Inca Trail to Machu Picchu permit. Your passport will be checked when you enter Machu Picchu , the Inca Trail and when you board the train. In case, you are renewing your passport, go ahead and send us a copy of your old passport to secure your permit and we can change it when you get your new passport. If so, please send us a copy of your new passport as soon as possible. The maximum group size is 10 persons. Our groups are between 2-6 persons. Sam Travel Peru specializes in SMALL and PRIVATE groups and provides personalized service. 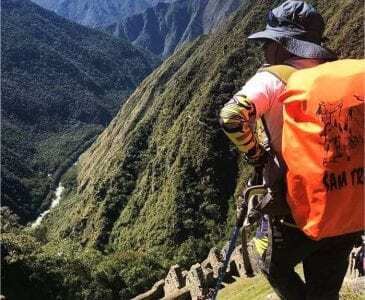 WHAT DOES THE CLASSIC INCA TRAIL TO MACHU PICCHU LOOK LIKE IN PEAK SEASON? Our Classic Inca Trail to Machu Picchu trek is unique to us and an out of the way location even during peak season, we will only occasionally encounter another group. You will have 1 cook per group. The number of porters will depend on the size of the group. For a group of 2 trekkers, there will have 4 porters, 4 trekkers will have 6 porters, 6 trekkers will have 9 porters, 8 trekkers will have 12 porters. The evening before you start your trek, you will be given a SMALL DUFFEL BAG to pack your clothes for the next four days. Your weight allowance is up to 7kg/15lbs. 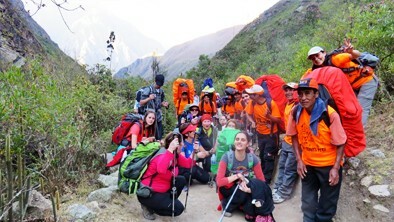 Your team of porters will carry your duffel bag, together with the food and camping gear. It’s important to be aware that you will not have access to your items in the duffel bag until the end of each day, as the porters will always be ahead of the group. During the trek, you will need a day backpack big enough to carry your personal belongings such as a warm jacket, a rain jacket, your camera, sunscreen, snacks, water, etc. A 30 to 50L backpack is sufficient. IS THE TREK DIFFICULT? DO I NEED TO BE FIT? The Classic Inca Trail to Machu Picchu is a 42km (24.4 mile) hike through the Andes within the Cusco region. The maximum altitude reached is at (4,217m/13,907ft). On the second day of the trek, we will climb two mountains. The trail is a fairly difficult trek and you should be well prepared and healthy prior to starting it. You have to be moderately fit and take regular exercise. In preparation: try walking 15kms/9 miles in a day or working out in the months leading up to the trek. It is also important to be well acclimatized to the altitude. Try to spend at least 2 or 3 days in Cusco (3,350m/11,047ft) prior to starting the trek. It has been highlighted by most of our clients, especially by our lady trekkers who request a private, clean and sanitary toilet!! 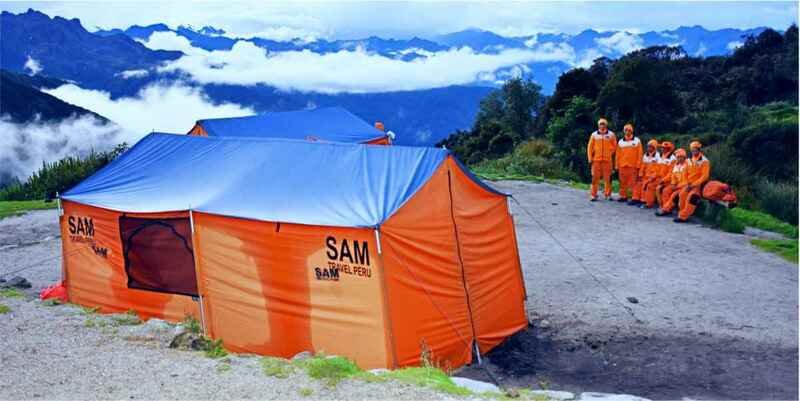 SAM Travel Peru toilet facilities have an individual tent and a camping toilet with a seat. Check out the picture, which illustrates how we set up our camping toilet on the trek by using this link: picture of toilet tent. Our toilet is always set up a comfortable distance from our campsite. At night if you need to use the toilet it is readily accessible and clean, unlike the dirty facilities supplied by the government. 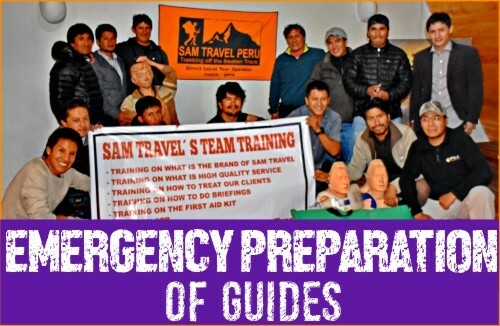 In the scenario that you are unable to finish the trek due to health reasons, Sam Travel Peru will assist you to the nearest town for help with transportation. We always carry oxygen on our treks for any respiratory problems. In extreme cases, a helicopter pick up can be arranged at your own expense. (Travel insurance is required and recommended). There are no refunds in the unlikely situation that you are unable to finish the trek. 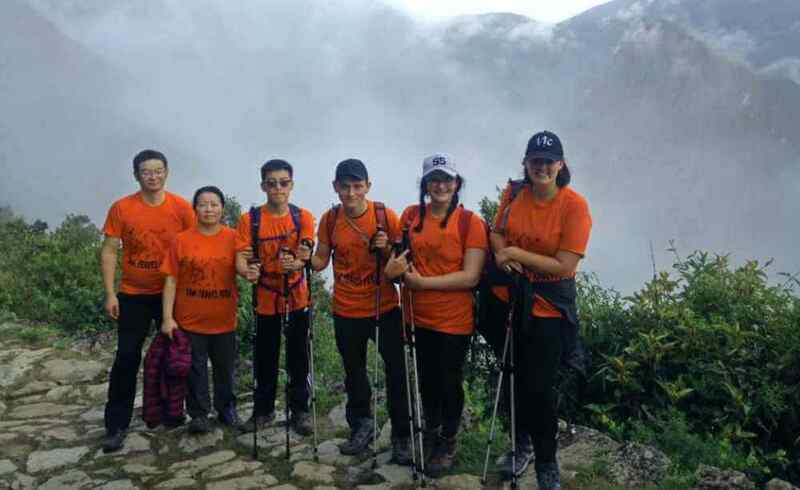 Generally, those who have to be assisted off the trail are taken to Ollantaytambo and if they recover quickly they continue the journey towards Aguas Calientes (cost incurred by trekker) and visit Machu Picchu according to the original plan. ARE WE DROPPED OFF AT OUR HOTEL AFTER THE CLASSIC INCA TRAIL TO MACHU PICCHU TREK? Absolutely!! Hotel pick ups and drop offs are included with all of our packages! If you have booked your hotel in the Sacred Valley, we will drop you off there and vice versa. It will depend on the train availability but the idea is to give you as much time as possible in Machu Picchu and enjoy the amazing views on the way back to Cusco while on the train. Therefore, you will take the train at 4:22pm. With this train schedule, you will have more than 9 hours to enjoy Machu Picchu! HOW MUCH IS IT THE VISTADOME TRAIN UPGRADE? The Vistadome train service has nicer seats, panoramic windows and ceiling. You will be offered snacks and a dance show will take place on board. The price is $57 USD per person, which includes the transfer from Poroy train station to your hotel in Cusco. It is 2 hours by train from Aguas Calientes to Ollantaytambo and then another 2 hours from Ollantaytambo to Cusco by bus. If you upgrade to the Vistadome Train, the trip from Aguas Calientes to Poroy takes 3.5 hours and then 25 mins by taxi to your hotel. Our clients are back at their hotel by 8pm. If you’re happy with the services provided, a tip – though not compulsory – is appreciated. While it may not be customary, it’s of great significance for the people who will take care of you during the trek. It inspires excellent service and is an entrenched feature of the tourism industry across many SAM Travel Peru destinations. Of course, you are free to tip as much as you want, depending on your perception of the quality and the length of your trip. Remember, a tip is not compulsory and should only be given when you receive excellent service. Yes, we are a local, sustainable & responsible tourism operator that incorporates universal principles of tourism: protect the environment and benefit the local communities by respecting their culture and religion. With this in mind, we have trained all our local staff to know and understand, respect the places and the local people. As a Direct Local Tour operator, we provide you with a duffel bag at your briefing and INCLUDE an extra porter, who will carry up to 7 kgs/14lbs including your 2.5kg sleeping bag, mattress and extra clothing.